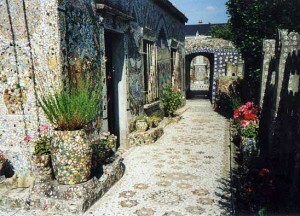 Mosaic – images or patterns created with small shards of stone, glass and other materials – has been popular “forever”. Remnants have been found that date back to the Third Millennium BC (you can see a brilliant example of this at the British Museum in London – the Standard of Ur, a mosaic of shell, red limestone and lapis lazuli) and it has been a much loved art form throughout history. In Mesopotamia, pebbles and terra cotta cones were used (sounds plain, but the results are astonishing) in floors and walls. Later on, the Greeks started cutting stones into shapes specifically intended for mosaic work (“tesserae”). 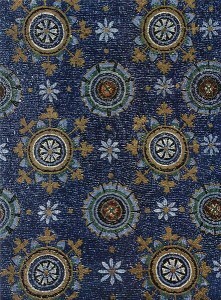 These became extremely popular, and at the time, almost every Greek house was decorated in some way with mosaic. The Romans heartily embraced this art form as well and took it to new heights, using it on floors, ceilings and as wall decor. Ravenna became the mosaic epicenter of the Roman Empire, and the tradition continues to this day: the International Association of Contemporary Mosaicists was founded (and is headquartered) here, and it is also home to CIDM – the International Centre for Documentation on Mosaic. 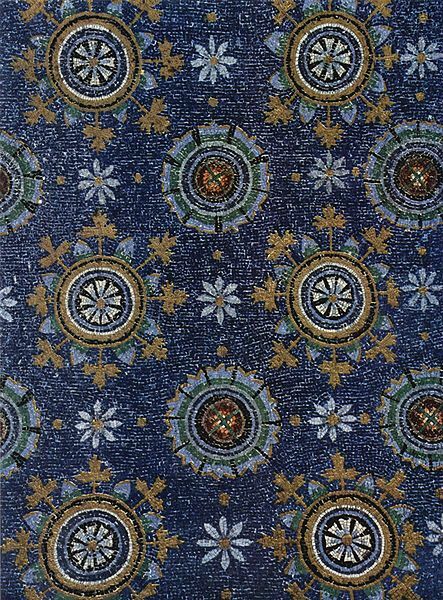 There are still many buildings in Ravenna with original works, and one gorgeous example is this mosaic tile ceiling (designed to look like a starry night sky) in the Mausoleum of Galla Placidia. Then came the Byzantine Empire, and this is when mosaic art really flourished and took on a different look, influenced by the East. Byzantine artisans used tesserae and small colored glass mosaic tiles called smalti to create extremely intricate and detailed mosaics. Excellent examples can be seen in St. Peter’s Basilica in Rome, and in various buildings in Ravenna, Sicily, Venice and Istanbul. 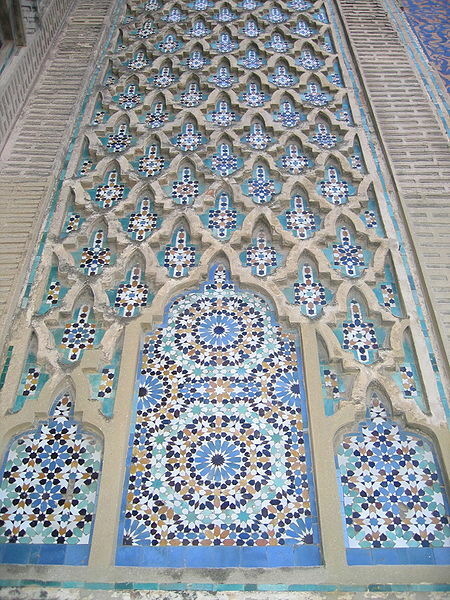 During the Renaissance, the popularity of mosaics took a plunge, and didn’t really come back into fashion again until the 19th century, thanks to the Art Nouveau movement. 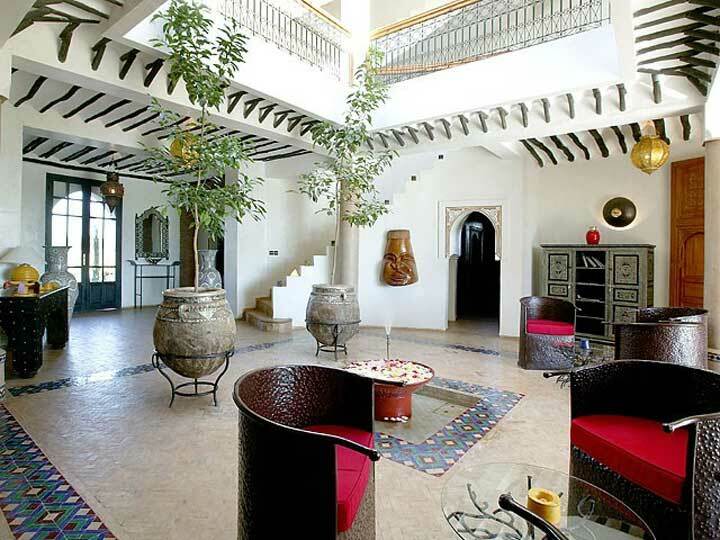 Famous examples from this time include Antoni Gaudi’s otherworldly buildings in Barcelona and La Maison Picassiette, the home of Raymond Eduardo Isidore who covered pretty much every surface inside and outside his home in tiles (a tad too much for my taste, but…). 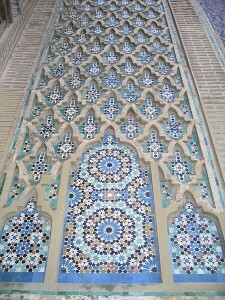 Few (if anyone) can beat the Italians when it comes to glass tiles. Bisazza, headquartered in Vicenza, make a huge variety of mosaic tiles, and one of my favorites is the “Chester”, which comes in both white and pink. Discreet and subdued are not words that come to mind when you think about Italian design in general, and the mosaics from Sicis are true to Italian form. Their collections range from “regular” tiles to colorful and unique to say the least. 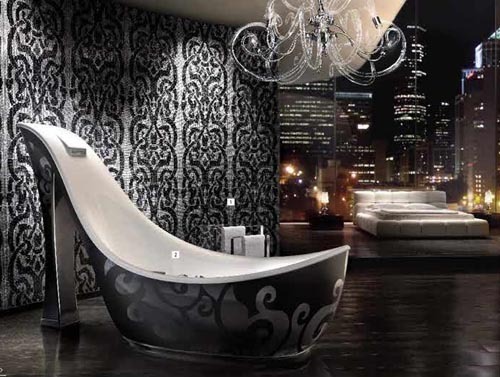 One of their more memorable creations is this bathtub (also, note the wall – all mosaic). 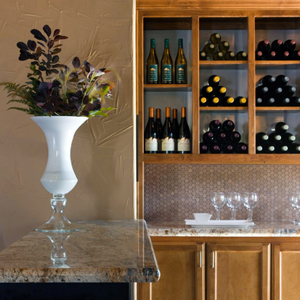 Recycled anything is hot these days, and penny cork tiles made from old wine corks is such a great example of how to repurpose something that you would normally just throw away. However, I’m not sure I’d want them on a bathroom floor (although they say that they are perfect for wet areas) since cork is an absorbent material. Maybe if they were sealed? 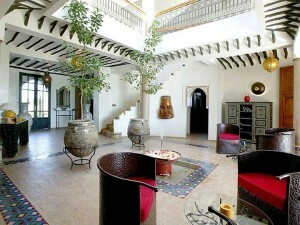 They may not be as glamorous as the glass tiles above, but they do look great on walls. I have written about Susan Jablon before (in my Kitchen Tiles post), and it’s no secret that I’m a big fan of both her work and her story. 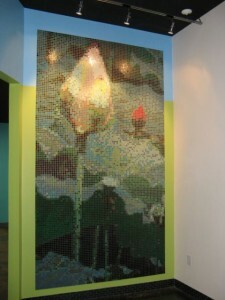 One of the newer additions to her collection is recycled bottle glass tiles. They are gorgeous and come in several different finishes (my favorites are the iridescent ones). Below is an example of what you can do with these tiles: this is a photo mosaic installation by Susan and her team, made with all recycled tiles (and a few of them even glow in the dark!). For more tiles, check out my Unusual Wall Tiles post.